Real-time last mile delivery notifications and photo of package delivery is just another way that Amazon is better utilizing technology to beat their competition by giving their customers the information when they want it. When I first saw news about this feature, it was in limit release only, and there wasn't much information at that time on how it works. I just got my first notification from Amazon on this feature. Although the feature is not likely to make or break my decision of whether I make my purchase with free 2-3 business day Amazon Prime, I do still double check prices at major retailers like eBay and Jet.com, it is handy and segregates Amazon one additional step from the competition. In some ways, I would argue that in a fairly short time, Amazon was able to replicate the parts of UPS and USPS that are critical to Amazon's business. Even though they do it on a much smaller scale, they are already improving the last mile shipping process. This is a feature available on the Amazon app, assuming that you're logged into your account. 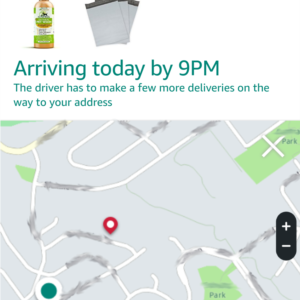 In my experience, I get an Android notification when the delivery was 9 stops away from my house. It showed a dot of the current location of the Amazon delivery truck. As I re-check the order page, the location dot occasionally updates with a new position for the Amazon delivery truck. As luck would have it, I happened to be home on that delivery day and was urgently expecting the package. It was the perfect situation. And even though it was only 9 stops away, the delivery still took quite awhile longer than I would expect for 9 stops. It would be a nice improvement to update the delivery time. For example, I got the initial "9 stops away" notification at around 1:30pm, but the "Arriving by" on the same screen still showed the original estimate of "by 9pm". Another service Amazon is offering as part of their last mile delivery service is providing photo proof of where they left the package. I've only seen this once before, but if they start enforcing this on every delivery (that Amazon delivers to your door), then not only does this give the customer comfort in knowing their package was delivered, but also keeps their delivery people honest. No more throwing packages over the fence. All in all, this is another way that technology is improving the entire process. Unfortunately, what it doesn't do is prevent strangers from swiping packages off your porch, but Amazon also has a suite of other products that you can install to help prevent this problem, is you trust Amazon to unlock your front door.